Your teeth are alive. Sometimes we forget htat fact. They don’t grow, like hair or fingernails, and tooth enamel is not comprised of living cells. 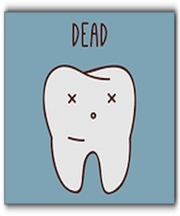 We’re reminded that they’re alive, and have active nerves, when we have a toothache or bite something too hot or cold. At Mason Dental in Grapevine, our job is to keep your teeth alive and healthy. Veins, arteries, lymph vessels and nerves live in the pulp of the tooth, below the enamel and dentin. When blood flow is cut off, the tooth begins to die. What can cause blood flow issues? Injury, trauma, infection, large fillings, and multiple restorations can impact a tooth’s blood supply. We can complete root canal therapy to save a dead tooth if required. During a root canal, the soft tissue in the root of the tooth is removed. Once the roots are cleaned out and widened, they are filled with a special rubber material. The root canal is only the first step in the complete tooth restoration. The final steps are the core build up and a functional crown. Root canals can last many years, but not always. Inadequate oral hygiene, decay, periodontal disease, an undetected crack, abscess, or degradation of root canal sealing materials can all cause a root canal to fail. At Mason Dental in Grapevine, we want all our patients to have healthy teeth and gums. That’s why we stress the important of regular brushing and flossing, and regular checkup in our office. In addition to root canal therapy, we offer a wide range of generaly dentistry services. Schedule your next cleaning and exam today.